We’ve just rolled out the latest update to the Greater New Orleans Community Data Center (GNOCDC) Repopulation Google Maps application. Thanks to Matt Priour figuring out how to add the Street View imagery to our New Orleans Repopulation Map, you can now not only see where people are coming back to The Crescent City, but the rebuilding efforts from the street level. 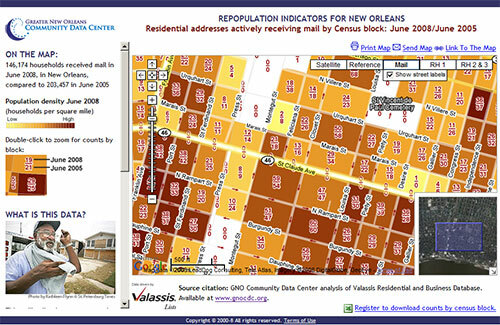 The map is powerful because you can look at the address counts by block between June 2005 and June 2008 and see how many people are returning to New Orleans. Of course you can pan over to the Lower Ninth Ward and see neighborhoods that are struggling to recover, but overall much of the city has recovered substantially. What is unique about this map is the source of the data. Getting accurate counts of the population of New Orleans has been difficult, but as this Wired article mentions, “Junk Mail to the Rescue”. Now the Google Street View imagery has been very good at helping see the reasons why changes have occurred after Katrina. The aerial imagery of New Orleans was taken on March 2006, near the low point of the recovery. If all you ever use to see the recovery of New Orleans is the Google Maps or Google Earth satellite imagery, you are many of the changes that have occurred more than two years since those images were taken. 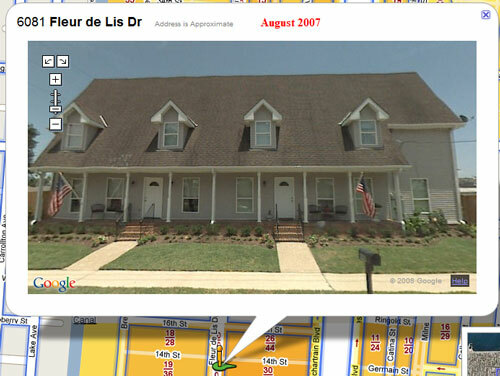 Even the Google Street View imagery is a year old which can distort realities on the ground. The USPS repopulation data is updated monthly so it is actually the most relevant data in this mashup application. What the Valassis data is great at documenting the recovery at a macro level, and the Google Street View data helps you analyze the results on a macro level. Being able to visualize the recovery this way gives you a great appreciation for how much work has been accomplished and how much more there has to be done. Unfortunately there was no “Marshal Plan” for the recovery, but progress has been made and hopefully tools such as this Repopulation Map will help further the rebuilding of New Orleans. I’ve been lucky enough to work with Denice Warren Ross, deputy co-director of the nonprofit Greater New Orleans Community Data Center and Joy Bonaguro on this project. Their vision of how they wanted this data presented to the community was to make it as simple as possible to use. 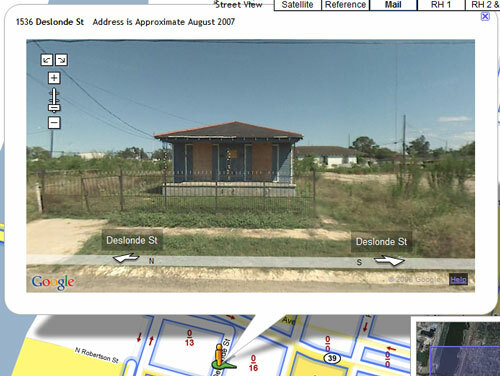 The ability to take data created in ESRI ArcGIS Desktop and serve it from Amazon’s S3 and integrate it with Google’s simple visualization tools (Google Maps and Google Street View) created a map that tells quite a story and is so much more useful than the PDF maps that existed before Katrina. Also, one thing to keep in mind is August 29th is the 3 year anniversary of Katrina’s landfall in New Orleans. The GNOCDC’s Katrina Index is a great way to see the progress of the recovery of New Orleans, three years later. Hurricane Gustov continues to head toward the Gulf Coast so everyone please be careful in its path.